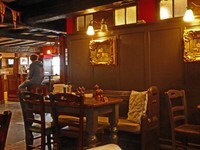 We looked at menus at the many restaurants in Hawkshead and The Queen's Head Pub was our choice. They had wonderful paintings of all kinds of dogs which was a plus. The food was excellent and the atmosphere pleasant.